MQTT today is an important part of the Internet of things, the service of outer complex security functions, architecture design belongs to the data forwarding servers at the same time, for example, an MQTT server, can solve different types of two sets of data exchange system, through subscription and transceiver interface design, it will only responsible for both ends to an exchange of data. MQTT server mode of transmission can be thought of as everyone through their internal engagement after entering a public chat room, if you want to communicate with others, you can create a chat room (push), you can also add other people chat room (subscription), server regardless of how to communicate between you, it will only help you to the chat room set up and free exchange of information between you can, also have completed the transfer. Xiao Ming want to send a message to the little red, so xiao Ming can create a topic (topic) of the chat room for sending (publish), then the little red to join (subscribe) this topic (topic) of the chat room, so she could get the xiao Ming's information, the old version of the MQTT chat room is public, between each other is free to join others' topic, also is the others can receive xiaoming, privately, but now the MQTT server allows you to define permissions (config), Let xiao Ming's topic only xiao hong can join. Code between under this architecture, we are the client code, also do not need to write the server receives the program to another, as long as the two sides agree on the data of the interface agreement is ok, because the communication between the too transparent, so the security so far are too dependent on the surface of certification, will be back to authority and to improve the communication control. 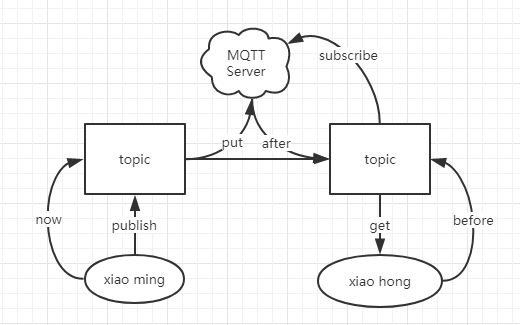 You can also test out the MQTT service directly online, subscribing to your own topic messages and sending your own. It won't show any data after running normally, otherwise it will report an error and flash back, so don't worry about whether it is working or not, if you need to confirm whether it is working properly, you can follow the following tutorial to try. 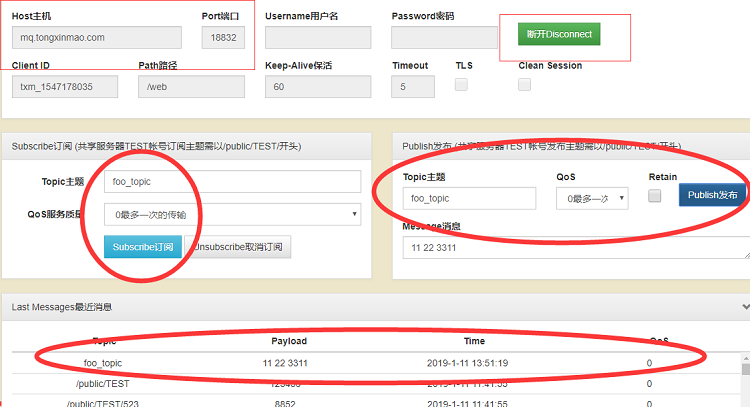 These are concrete examples of MQTT and should run as follows.The board will send a hello data to the person who subscribed to the foo_topic topic, which should be displayed to the user who subscribed to the topic on the web page. 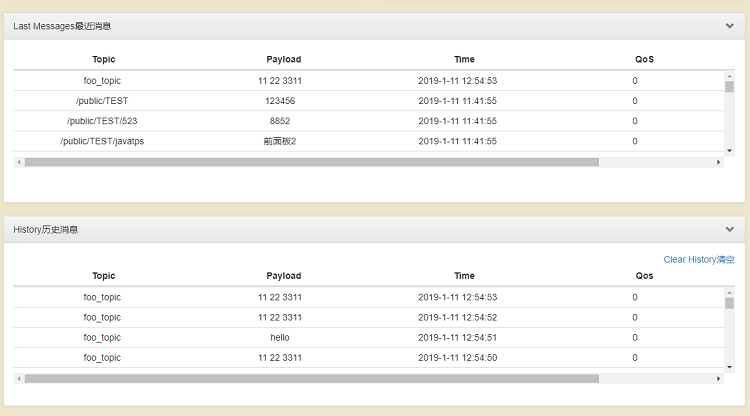 The board has subscribed to the foo_topic topic, so it will receive 1's previous hello data sent by itself, and then, according to the code, it will send the received data back intact, so at this time, the board will loop receive and send data on the foo_topic topic. If we send data to the foo_topic on the web page, the board will receive the data and display it accordingly, such as 11, 22, 3311 shown in the figure. 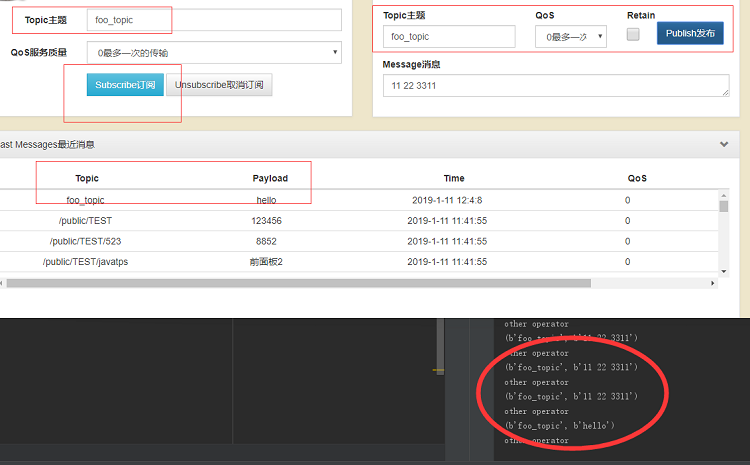 Notice that your new data will also participate in the output data of the loop mentioned in 2. This page was last edited on 23 February 2019, at 21:19.